Tim Hortons has tarnished its brand considerably. The company needs to wake up and smell the coffee. Its recent actions have disappointed customers who affectionately refer to the restaurant chain as "Timmys." On January 1, 2018. the minimum wage in Ontario was raised from $11.40 per hour to $14 per hour. It will increase further to $15 per hour on January 1, 2019. 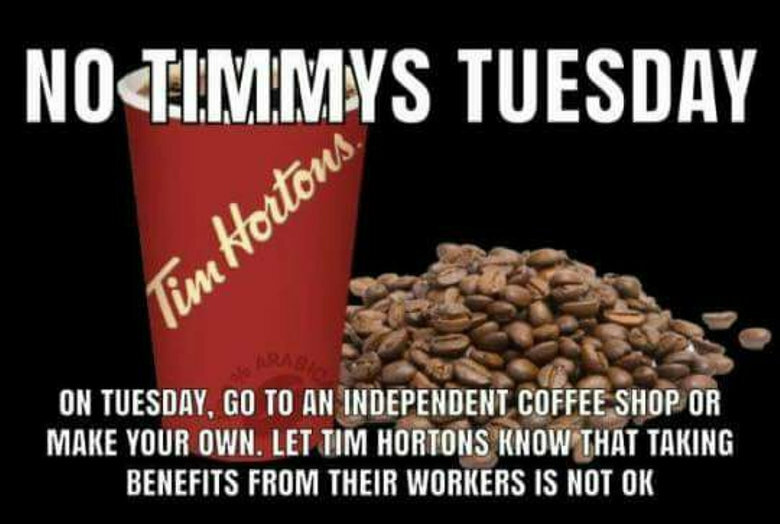 To offset the increase in labour costs, some of the province's employers have chosen to take punitive measures against their employees by doing away with paid breaks or increasing workers' contributions for benefits These clawbacks have been put into effect at Tim Hortons restaurants in Leamington. Port Hope and in the Coburg area. The Coburg Ontario franchises are owned by Jeri Horton-Joyce and Ron Joyce Jr., the married offspring of the company's founders. In a letter to employees at two Tim Hortons in Coburg, the couple informed staff that as of January 1, 2018, they would no longer be entitled to paid breaks and that they would also be required to pay a portion of the costs for dental and health benefits. Some background: The first Tun Hortons doughnut shop was opened in Hamilton, Ontario in 1964 by Canadian hockey star Tim Horton and Jim Charade (1934-2009) In 1967, Horton entered into a business partnership with investor Ronald Vaughan "Ron" Joyce. (Tim Horton's eldest daughter, Jeri-Lyn, is married to Joyce's son, Ron Joyce Jr.). On February 21, 1974, Horton, 44, died in a single-vehicle crash near St. Catharines, Ontario. After the hockey player's death, Ron Joyce purchased Horton's share for about $1 million and assumed control over business operations. Under Joyce's stewardship, the chain was expanded into a multimillion-dollar franchise. In 2014, Burger King purchased Tim Hortons for US$11.4 billion and the chain became a subsidiary of Restaurant Brands International (RBI), an Oakville, Ontario-based holding company. 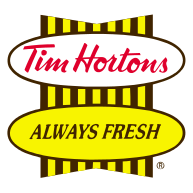 Restaurant Brands International, the parent company of Tim Hortons, has attempted to distance itself from the current controversy and absolve itself from responsibility. It has said that the decision to pass minimum wage costs onto employees was made by"rogue franchises." and does not reflect the "values' of the company. In effect, RBI has shifted the blame to the franchises. For their part, individual franchises have told CBC News that they have been forced to reduce benefits because the head office refuses to permit price increases. A spokesperson for Great White Franchisee Owners, which represents the franchise owners who have been quarrelling with RBI, has defended Ron Joyce Jr. and Jeri Horton-Horton Joyce. She declared that "they like many Ontarians, are hard-working small business owners who are striving to keep their businesses viable and keep all their employees employed." That may be true in many cases, but Ron Joyce Jr. is the son of a billionaire. In an interview with the CBC News, Ontario Premier Kathleen Wynne came out with some sharp words in response to the minimum wage situation. She described the clawbacks as "the act of a bully." She further stated that "if Mr. Joyce wants to pick a fight, pick that fight with me and not the people who are working at the service windows of the stores." The premier also said that "Tim Hortons is a really important part of daily life for Canadian families. But so is having a decent living wage." I won't mince words here either. Tim Hortons response to the minimum increase has been petty and vindictive. It seems determined to make workers or the public pay the price for a wage increase. Whether one agrees with this increase in minimum wage or not, the company's actions have been unconscionable. To treat workers in this fashion is simply mean-spirited and unfair. Yes, I realize that running a business isn't easy, whether it be a large corporation or a small convenience store. Nevertheless, employees and workers don't have to be on opposite sides of the fence. It is no secret that well-treated workers are happier, healthier and far more productive. The most savvy employers know that respect is a two-way street. They know that good relations between business and labour is a win-win situation. Thus, they strive for what is mutually beneficial. To be fair, Tim Hortons isn't the only business to react to the minimum wage increase. Ontario workers at Sunset Grill, Wimpy's, East Side Mario's and other businesses have been told that they are going to take a hit due to the minimum wage hike. However, it's difficult to accept that large corporations are severely hampered by the minimum wage increase. According to a report by Jennifer Wells in the Toronto Star, the minimum for Canada's top CEOs is now $5.2 million a year. The average is $104 million. Isn't it time low wage workers received a few crumbs? They have bills to pay and they have to put food on the table. Their income has to keep pace with inflation. The situation has prompted a backlash from labour groups and the public. Demonstrators from Ontario labour unions have turned out at Tim Hortons locations. A social media movement on Facebook is exhorting people to boycott Tim Hortons on Tuesdays. All in in all, this has been a public relations disaster for the iconic company.